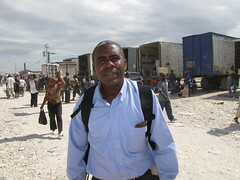 I recently returned from 11 days of reporting in the Dominican Republic and Northern Haiti. Here's one of the stories from the trip on the mass return of Haitians living in the Dominican Republic to Port-au-Prince in an effort to retrieve relatives left homeless or injured by the Jan. 12 earthquake. SANTO DOMINGO, Dominican Republic (CNS) -- Saintivo Gassant boarded a small, intercity bus with 37 other passengers -- mostly fellow Haitians -- at a ramshackle station in the Dominican capital, beginning a seven-hour journey back to the rubble of his native Port-au-Prince. He carried a backpack stuffed with documents: immigration papers, a copy of his university degree, and even photos, including a snapshot of him with the president of the Dominican Republic at a tourism exhibition. He clutched the backpack tightly for much of the first leg of the journey, knowing its contents could prevent any glitches in his attempt to bring his 12-year-old daughter, Kimberley, back to the Dominican Republic. Gassant knew few details about her situation, just that Kimberley had been living temporarily with her mother when the magnitude 7 earthquake flattened the Haitian capital Jan. 12, and that she was now living in the street, under the care of his sister. "I still don't know the whole story," he said Jan. 26, explaining that he learned of Kimberley's fate in a brief, Jan. 16 phone call. "My return home will be completely unexpected for them." Gassant was just one of the thousands of Haitians living in the Dominican Republic -- and points farther abroad -- to return to Port-au-Prince in search of information on loved ones and, in many cases, to retrieve them from the ruins of an earthquake that claimed an estimated 200,000 lives and destroyed a city that will not be fully reconstructed for years. Read more at Catholic News Service.